In the original Hebrew, "Vanity of vanities; all is vanity" is written as הבל הבלים הכל הבל (Hebel Hebelim Hekel Hebel) which has a gematria value of 216. These words are repeated in Ecc 12:8, which is the 216th verse of the Book of Ecclesiastes. Clearly the number 216 requires further investigation. 216 is the smallest magic product of a 3 by 3 multiplicative magic square. "Though the rulers you have trained for your city are wise, reason and perception will not always enable them to hit on the right and wrong times for breeding; some time they will miss them, and then children will be begotten amiss." "For the number of the human creature is the first in which root and square multiplications (comprising three dimensions and four limits) of basic numbers which make like and unlike, and which increase and decrease, produce a final result in completely commensurate terms." This seemingly indecipherable text can be better understood when it is realized that in Plato's day there was no word for "cubed", and that 216 is the first (smallest) cube which is the sum of three cubes. Most scholars agree that the number referred to is 216. In the Bible, the number of a man is 666. Given that Plato's Republic was written 400 years before the Revelation of St. John, it has been hypothesized that 216 was the originally intended number of a man. Read the original article "The Number of the Beast" here. Indeed, some versions of the Bible have the number as 616, which is a hybrid between the two. Revelation 666 : "For it is the number of a man..."
Plato 6*6*6 : "For the number of the human creature is…"
In the twenty-first chapter of the Book of Revelation, St. John describes his vision of the new Jerusalem which will descend from heaven at the end of the age. St. John states the dimensions: new Jerusalem is also a cube! The number 12, being the number of the tribes of Israel, and the number of Christ's apostles also figured prominently in John's vision. Another familiar number (remembering the 144,000 from Rev. 17:4 and Rev 14:1) also figures in the description. The world population has grown exponentially since the Black Death plague of 1348-50, which killed between 75 and 200 million people. 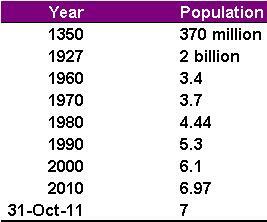 At the end of 2011, the world population was 7 billion people. Estimates from the United States Census Bureau are that the population will reach 8 billion in the year 2027. 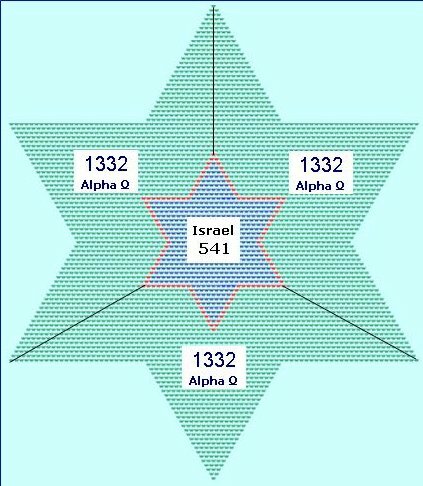 As we have seen from the gematria of verses 3:19 and 9:10 in the Book of Proverbs, 216 is the perimeter of the Alpha and Omega sections of the Wisdom Star. The Genesis triangle also has a perimeter of the same 216. The seventy-two names are divided into four columns of eighteen names each. Each of the four columns represents one of the four letters of the Tetragrammaton. The names are known collectively as Shemhamphorasch. These 216 letters were the theme of the 1989 movie Pi, directed by Darren Aronofsky. Asked in an interview about the number 216, Aronofsky replied "It's true. All the cabal stuff in the film is completely 100% real. Totally non-fictional. I studied with a lot of leading cabal scholars in the world. And they shared with me a lot of their secrets. Everything you see on the screen is completely 100%, totally, fully, completely real." Revelation 20:1-5 relates to the prophecy of the 1,000 year reign of Christ in person, also called the Millennium. There has been a good deal of speculation regarding America in Bible prophesy, beginning with the early colonists. In 1857, Methodist minister Fountain Pitts delivered a daylong sermon on the subject in the U.S. Capitol. See here for a transcript. Much of the speculation focuses on the year of America's independence - 1776. Abraham (אברהם) has a gematria value of 248, and the word "Abraham" appears in 216 Bible verses (KJV). Reflecting these numbers, the word "praise" appears 248 times in 216 Bible verses (KJV). Not surprisingly, 132 of these 216 "praise" verses appear in the Book of Psalms, a collection of poetic prayers. The Hebrew name for the book is Tehilim (תהלים) which means "songs of praise". In the Tanakh, Hallelujah is only once written as a single word (Psa 106:1). This is the first Psalm to open with Hallelujah, where the gematria value of the phrase "for his mercy endureth forever" (כי לעולם חסדו) is the same as that for θεος (Theos, translated as "God") in the Greek New Testament. Elsewhere, it is a combination of two words הַֽלְלוּ ("praise") and יָֽהּ (Yahh, meaning "the LORD"). The word combination הַֽלְלוּ־יָֽהּ (Hallelujah) appear 23 times in the Bible. 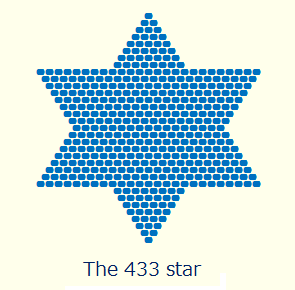 Beginning from position 23 in pi are the three digits 433, which is the 9th star number. On either side are the numbers 26 (the gematria value of the Tetragrammaton) and 832,which is the gematria value of ארץ ישראל (Eretz Yisrael, meaning "the land of Israel"). Hallelujah (הַֽלְלוּ־יָֽהּ) has a gematria value of 86, the same as אלהים (Elohim, meaning "God"). The word אלהים appears 680 times in the Tanakh. The first occurrence of 680 in pi is followed by the three digits 661, which is the 11th star number. The first mention of the word "praise" in the Bible is in the naming of Judah (Gen 29:35), where the phrase "I praise the LORD" (אודה את יהוה) has a gematria value of 443. The Gospel of John opens with "In the beginning was the word..." (Joh 1:1). Judah means "praised" (Strongs H3063). The word "Judah" appears 813 times in the Bible (KJV), which is the gematria value of the third verse in the Bible, when God said, Let there be light: and there was light (Gen 1:3). The verb הלל (halal) is usually translated as "praise", but literally means to "shine" as seen in Job 3:29. For a brilliant interactive demonstration of how this number works in nature, click here for the Maths is Fun website. Number 108, or 216 ÷ 2, is also aligned with the golden ratio. A chord of a circle, with an angle of 108º, is in golden proportion to the radius of the circle. In the diagram, the chord length AB is in golden proportion to the radius AC or CB. The relationship between Earth and its two great lights is also centered on 108. 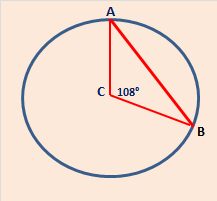 A chord AB with an angle of 108º is in golden proportion to the circle's radius. The distances are averages. Actually, because planetary orbits are elliptical, these distances vary. For example, the distance between the Earth and the Sun varies from 105.7 (perihelion) and 109.3 (aphelion) times the Sun's diameter. It is because the sun is about 400 times bigger, but 400 times further away than the moon, that they appear to be the same size to our eyes. Try this experiment. Cut out a circle of 1 inch diameter (or use an American quarter) and ask a friend to hold it up against the moon. Now back away until the disk just covers the moon (total eclipse). Measure the distance between your eyes and the disk. Answer? 108 inches. The same is true of the sun, but don't do it or you'll hurt your eyes. To fully appreciate this coincidence, compare the total solar eclipse viewed from Earth (1999) with the moon's transit across the sun taken from the STEREO-B spacecraft in Feb 2007. Because the spacecraft was a million miles from Earth when the film was taken, the moon appears proportionately smaller. The strange color of the sun is because STEREO-B captures it in four wavelengths of extreme ultraviolet light. 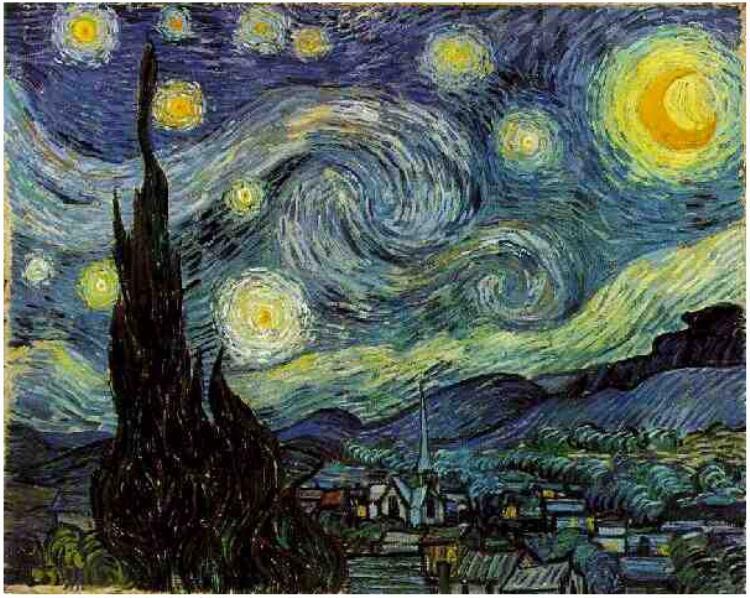 One of the world's most recognizable cultural icons is Vincent van Gogh's oil on canvas A Starry Night. Painted in June 1889 whilst van Gogh was a voluntary resident at an asylum in Saint-Remy de Provence, it depicts a view of the eastern sky from his second floor room at the asylum. Harvard astronomer Charles Whitney and UCLA art historian Albert Boime independently proved that the celestial objects in the painting were in accord with the astronomical records from that time. A Starry Night was painted between 16-18 June, 1889. Vincent had written in a letter to his brother Theo "This morning I saw the countryside from my window a long time before sunrise with nothing but the morning star, which looked very big." Now with the benefit of modern astronomical software, we can compare the positions of the moon and Venus (the bright and morning star) on the day Vincent wrote to Theo informing him of the picture's completion. An easterly view of the night sky for an observer in Saint-Remy de Provence, before sunrise on June 19, 1889. Starry Night Software. A Starry Night by Vincent van Gogh, painted between June 16-19, 1889. The morning star (which looks very big) and the moon are in their correct positions. Vincent van Gogh was born into a family of theologians and painters. His grandfather was a theologian in the Dutch Reform Church, and prior to committing to the life of an artist, Vincent's calling was as an evangelist to the poor. Given his background, it's not surprising that the eleven stars depicted in A Starry Night is a reference to the dream of Joseph from the Book of Genesis, in which the sun, the moon and eleven stars (representing Joseph's father, mother and eleven brothers) bowed down in reverence to Joseph. The time Vincent spent at Saint-Remy was particularly productive, with works including Irises, Wheat Fields With Cypresses and the blue self portrait. He suffered a second mental breakdown in July 1889, and died a year later from a self inflicted gunshot wound aged 37. In number theory, Euler's totient function (also called the Phi or φ function) is a mathematical function that counts the number of positive integers less than n, that are relatively prime to n. The Khan Academy offers a short explanatory video here. During his artistic career, Vincent van Gogh produced 860 oil paintings and 1300 drawings, sketches, water colors and prints. There is also a theory that A Starry Night was influenced by the epic poem Song of Myself penned by Walt Whitman when he was himself 37 years old. In that poem, Whitman referenced the conservation of energy, which may have resonated with Vincent when he took his own life when at that same age. I hasten to inform him or her it is just as lucky to die, and I know it." In a letter written to a friend in 1888, van Gogh himself wrote "A starry sky is something I should like to try to do, just as in the daytime I am going to try to paint a green meadow spangled with dandelions." He compared the stars to dots on a map and mused that, as one takes a train to travel on earth, "we take death to reach a star." 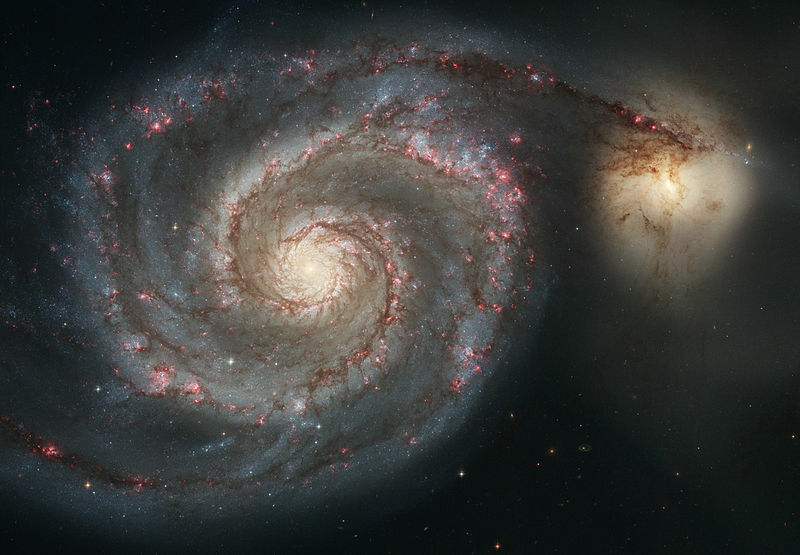 It is known that Vincent was keenly interested in scientific research at the time, and Charles Whitney has suggested that the swirls in A Starry Night's sky were influenced by a sketch of the M51 (Whirlpool) galaxy by astronomer William Parsons (3rd Earl of Rosse) in 1845. Using a 72 inch telescope at Birr Castle in Ireland, Parson's was the first observation of a spiral nebulae, although it wasn't recognized as a galaxy until the time of Edwin Hubble. William Parson's sketch of the Whirlpool Galaxy from 1845, said to have influenced the swirls in Vincent van Gogh's A Starry Night. In the evening of June 19th, 1889, the M51 galaxy was positioned above the eastern horizon to an observer in Saint-Remy de Provence. At the same time, another galaxy (NGC 4725) was located in the same section of the sky. 4725 is the gematria value of Gen 37:9 (see above). The locations of the M51 and NGC 4725 galaxies over Saint-Remy de Provence in the evening of June 19th, 1889. Daylight obscured for the purpose of clarity. Starry Night Software. At that time, the M51 galaxy was exactly 37 million light years from Earth. 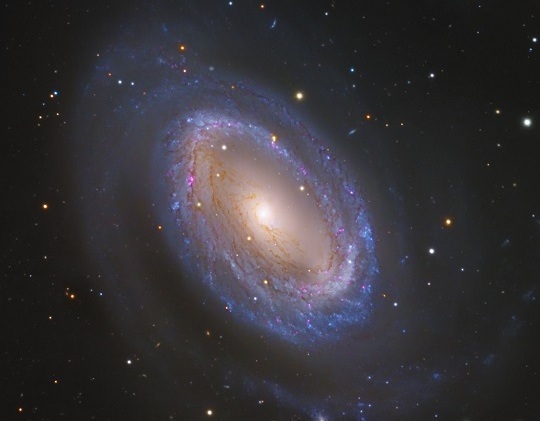 The NGC 4725 galaxy was 45 billion light years from Earth, at a declination of 26 degrees. 45² + 26² = 2701 (gematria of Gen 1:1) "In the beginning, God created the heaven and the earth." If Vincent was indeed inspired by Lord Rosse's sketch, one can only imagine how he would have reacted to the astonishing imagery of the galaxies available to us today. The NGC 4725 Galaxy in the constellation of Coma Berenices. Image Credit & Copyright: Robert Gendler, Subaru Telescope (NAOJ), Hubble Legacy Archive. Doubtless Vincent would have been even more astonished by an image of the core of the spiral M51 galaxy. The "X" is due to absorption by dust and marks the exact position of a black hole which may have a mass equivalent to one-million stars like the sun. The vertical bar is estimated to be 100 light years in diameter (5.88 trillion miles) which may be an edge on dust ring which hides the black hole. This image would surely have affirmed Vincent's religious faith and strengthened his belief in an afterlife. "X" Structure at Core of Whirlpool Galaxy (M51). NASA's Hubble Space Telescope.